Whilst most of our customers and partners best know us for our production of soda ash, sodium bicarbonate and salt, Tata Chemicals Europe in Cheshire also delivers an almost unsung service: energy generation. The production of soda ash, sodium bicarbonate (bicarb) and salt is an energy intensive activity, requiring both heat and electricity. To provide this energy for Winnington and Lostock sites, TCE uses a combined heat and power (CHP) plant at Winnington, which has capacity to generate 400 MWth of heat and 96MWe of electricity. Steam and electricity are used at Winnington in the production of high grade bicarb. A private wire and steam network transfers the steam and electricity roughly 5km across Northwich to Lostock Gralam, where it is used in the production of soda ash and bicarb. Alongside TCE’s energy needs, the power plant also provides heat and electricity to local industrial users and supplies electricity to the local distribution network for use by consumers and businesses as well as supporting the wider UK electricity system. The electricity produced by the CHP plant is enough to power 200,000 homes! The Winnington CHP has two gas turbines that can operate in tandem or individually dependent on energy demand from the process plants and the local electricity grid. So, How Does Tata Chemicals Europe Generate Energy? The energy generated at Winnington comes from a highly efficient, low carbon CHP plant. Natural gas is drawn from the high-pressure gas transmission network and used to power gas turbines that drive electricity generators. The hot exhaust gas from each turbine is captured and used to help heat water and generate high pressure steam. The steam is then used to drive a steam turbine that also generates electricity whilst reducing the pressure and temperature of the steam to a level suitable for the soda ash and bicarb production processes. As Winnington CHP has two gas turbines, which can operate individually as well as in tandem, when one turbine needs refurbishment work, it causes no down time. However, as our current refurbishment project shows, it is a truly international mission! 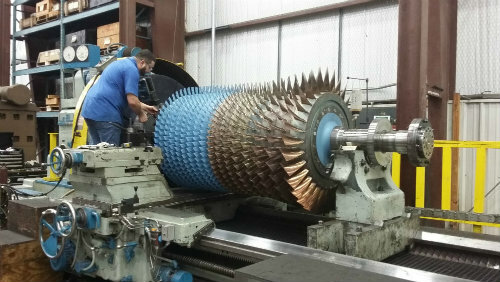 Repairing a damaged rotor (pictured) has meant sending one of the turbines on a 10,000-mile round trip to Houston, USA, where Sulzer have replaced over 500 blades. The rotor weighs 11 tonnes and is 5m long and nearly 2m high, so making this trip is no small feat! Adding to the project’s global credentials, parts are being sourced from Thailand, the Netherlands, Scotland and France, as well as from other UK based companies. The Tata Chemicals Europe Energy team and Eon, the operator of the CHP plant, have been working on the project since January 2018, with the turbine due to be recommissioned in Summer 2018. Heat and power is being generated by the other gas turbine during this period.